As a value added distributor that primarily focuses on Mid-Market to Enterprise Security solutions, we look forward to advising Resellers on BeyondTrust’s cloud & virtual security, vulnerability assessment, & compliance management products. 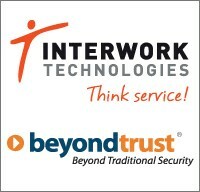 Interwork Technologies, Inc., a North American specialty distributor of Security, Information Management, and Communications solutions, today announced a strategic agreement with BeyondTrust Corporation, the only security solution vendor providing Context-Aware Security Intelligence, giving customers the visibility and controls necessary to reduce their IT security risks while at the same time simplifying their compliance reporting. Through this agreement, Interwork Technologies, Inc. will provide its extensive roster of customer access to BeyondTrust’s industry-leading BeyondTrust Context-Aware Security Solutions. BeyondTrust’s Context-Aware Security Intelligence solution allows customers to protect their infrastructure and data across the entire IT landscape: making every device - whether on a desk or in a data center, in a pocket or a virtual machine, or in the cloud - as secure as possible. BeyondTrust solutions identify and remediate the vulnerabilities that form the basis for cyber-attacks, and mitigate internal threats that arise from the accidental or intentional misuse of system or device privileges. In short, they protect from both the external and internal threat. BeyondTrust is the only security solution vendor providing Context-Aware Security Intelligence, giving customers the visibility and controls necessary to reduce their IT security risks, while at the same time simplifying their compliance reporting. BeyondTrust offers consistent policy-driven vulnerability and privilege management, role-based access control, monitoring, logging, auditing and reporting to protect internal assets from the inside out. The company’s products empower IT governance to strengthen security, improve productivity, drive compliance, and reduce expense across physical, virtual, mobile and cloud environments. For more information about BeyondTrust’s Contact-Aware Security Intelligence solutions, visit: http://www.beyondtrust.com.